← How to convert doc to postscript using Document Converter? This task seems to be a little hard for you if you don’t have a converting software in your computer.But when you get access to docPrint Pro,everything becomes easy!To docPrint Pro,converting doc to ps is a piece of cake because it can convert MS Office 97/2000/XP/2003/2007, WordPerfect, AutoCAD DWG, PostScript, Adobe Acrobat PDF and many other document types to Adobe Acrobat PDF, PostScript, EPS, XPS, PCL, JPEG, TIFF, PNG, PCX, EMF, WMF, GIF, TGA, PIC, PCD and BMP etc formats. It works in both GUI version and Command Line version. With docPrint Document Converter Professional you can convert your documents from and to 50+ formats easily. NOTE:Microsoft Office is required for converting word files,which is a useless note because maybe each computer has Microsoft Office. Just download docPrint Pro at http://www.verypdf.com/artprint/docprint_pro_setup.exe. You will see it is an executable file from the website and you can install docPrint just by double clicking the setup file and click “Next”, “Next” and follow the prompts appear in each dialog box.Please don’t worry about the safety of docPrint Pro,there is no virus when you download it to your computer. Here are some easy steps to help you convert doc to ps format file,you’d better use docPrint Pro and try it yourself and you will master it very soon.Trying is a good teacher,isn’t it? Firstly,find your doc file in your computer and double click to open it.Of course,you can also right click the doc file and click “Open” in the dropdown list to browse your file.Then the following two ways will help you to run printer driver in your computer. 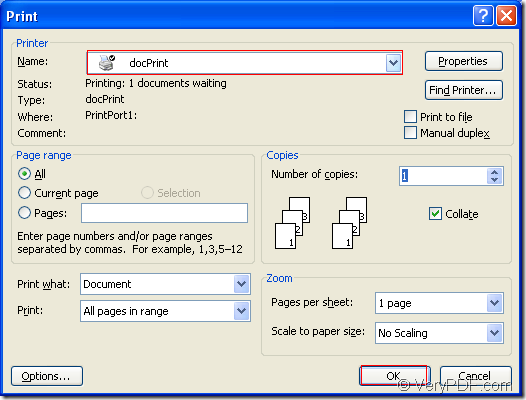 Click “File” and click “Print” in the dropdown list.Then you will see a “Print” dialog box appears in the interface and you should choose “docPrint” as the printer of your computer in “Name” combo box. Press “Ctrl”+ “P” on your computer at the same time.This way is always taken by many people. There is an other way which can save your time a lot.If you have set the docPrint Pro as your default printer when you install it,you can right click the doc document and click “Print” option to run docPrint instead of opening the file. Secondly,in popup docPrint dialog box in Figure2,you can do the following operations to open “Save As” dialog in which you can save your target file. Click “File” button in the toolbar and click “Save As” in dropdown list. You can also click the icon to realize the same function. The hot key “Ctrl” + “S” is a very quick way to open “Save As” dialog box. 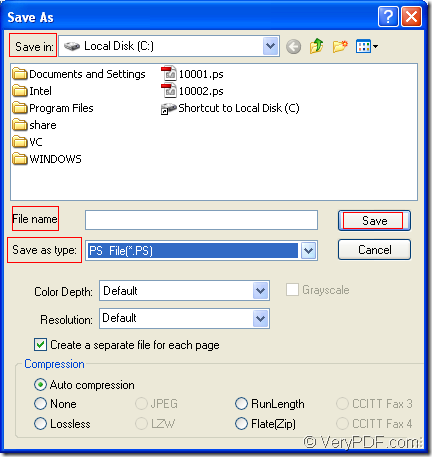 Thirdly,also the last step,you should do the following operations in “Save As” dialog box showed in Figure3. In “Save in” combo box,you should choose the directory for your target file in any location of your computer according to your need. In “File name” edit box,you can edit a name for the target file. 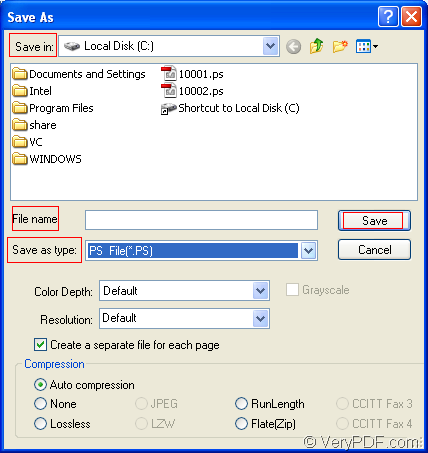 In “Save as type” combo box,there are many output file formats which docPrint Pro can support,you can choose one for your target file.Here you should select “PS File(*.PS)”. Save your target file by clicking “Save” button. You can find your target file in the specified location in several seconds later,which marks the end of the conversion of doc to ps.If you want to learn more functions about docPrint Pro,you can click on the following link http://www.verypdf.com/artprint/index.html. 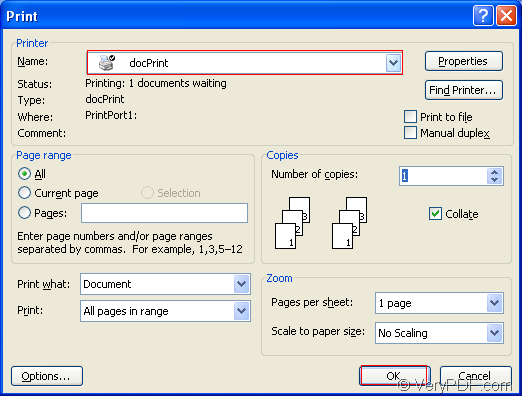 You can also read more articles about docPrint Pro at the website http://www.verypdf.com/wordpress/. How to convert DOC to PS via command line? How to convert MS Office Excel documents of XLS to PSD? Convert Office to PDF in batches. How to set docPrint as default printer? This entry was posted in docPrint Pro and tagged doc to ps. Bookmark the permalink.